We’ve just brought the sweetest vintage Coca-Cola machine we have ever found to our booth D-5 at Old Glory Antique Marketplace in Frederick, Maryland. The C51A Coca-Cola machine is in excellent working order! We purchased it from a huge Coca-Cola collector who let go of his entire collection to us last weekend.) The owner used this machine until the day we put it on our truck. We’re asking $5,600 but are always open to reasonable offers. A few minor scratches here and there and a few screws on the back panel fell off and disappeared while we were moving it but overall this is a gorgeous machine. Visit Old Glory seven days a week and ask the staff to call us if you’d like to make an offer. You can also contact us ahead of time with an offer. See more photos of the Cavalier C51A on our Orion’s Attic Facebook page. 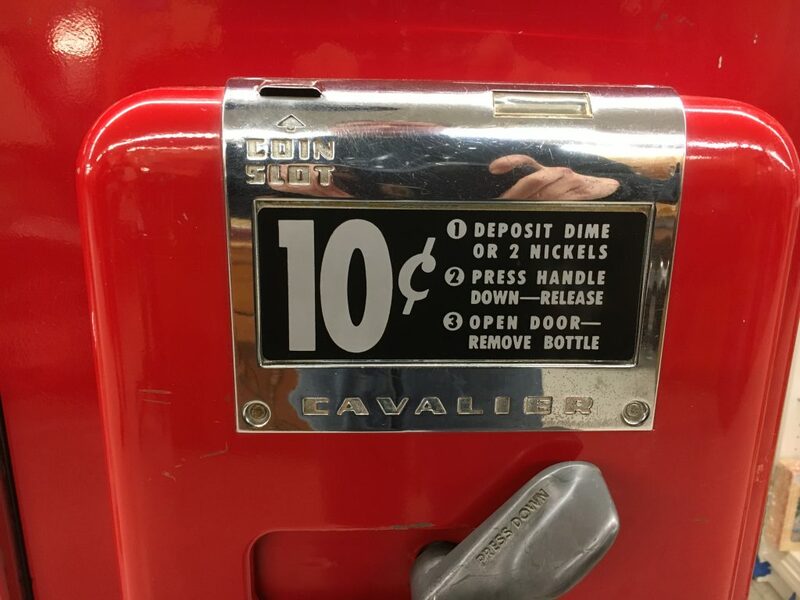 Stay tuned to our web site and to our eBay store to see the beginning of the more than 1,500 Coca-Cola collectibles we purchased the day we picked up the Cavalier C51A Coca-Cola machine. The seller is a long-time member of The Coca-Cola Collectors Club. We are swimming in fizz right now with an ocean of Coca-Cola neon lights, lamps, Barbies, plush animals, magnets, buttons, sandwich boards, Christmas ornaments, radios, coolers, toys, a fan, glasses, barware and more. If it has Coca-Cola on it, we probably now have at least 20 of them. Do you know anyone looking to sell a prized collection or who needs an estate sale, estate liquidation or home clean-out? Contact us today! We’d be glad to help. Orion’s Attic provides estate sale and estate liquidation services throughout the greater Washington D.C., Maryland, Northern Virginia region and beyond.